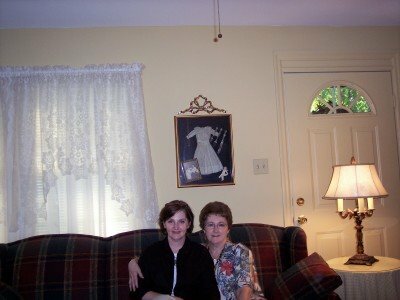 I was checking out http://www.sandysknitting.com/ which I recently found through someone else's blogsite and saw the entry for Saturday Sky. Check out Sandy's website and sign up! Basically, Sandy thought that since Saturday is a slow day to blog that she would start a post where you walk outside and take a pic of YOUR Saturday Sky! Best of all.....there will be a contest to win yarn!!! How much better can it get???? Winner will be drawn on July 1st. 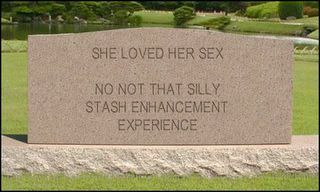 As I have nothing stupendous to show for my knitting (not that I ever do)....I thought I would post a bit of humor!! I HAVE been knitting a bit but it is so hard to do anything!! Have you ever been in a sauna....?? Well that is what it is like here in Alabama....triple digits last week with about 90% humidity! The AC units run full blast and STILL you can't breathe or move for all the heat and humidity!! It absolutely wipes you out!!! By 7:00 p.m. the energy is GONE but I REFUSE to go to bed while it is still daylight outside!! I have been working on getting my Sugar and Cream stash depleted....slowly. I'll try to get the energy to drag out my camera and post some pics. I did get my heartbeat up when I found out about the KnitPicks interchangeable knitting needle set!! Guess I'll have to break down and get a set so when I get my knitting MoJo back I'll be all set to go!! My sweet little Princess Cupcake (otherwise known as Montana) is having surgery this Thursday and appreciate everyone's prayers for her!!! (see previous posts). She has promised to let me make a picture of the scarf she is currently working on BEFORE she gives it away!! She finished her "warshrag" she started at Chicks with Sticks but gave it away before I could get a picture of her with it!! But that is just the way she is.....sweet little giving heart!!! Montana with all her knitting "utensils" as she called them!! LOL!! She was sooooo excited about choosing her own "utensils"!!! I believe she is off to a good start!! Although I was a bit disapointed when she said she didn't want to buy anymore yarn until she had finished this "project".....oh well....she is young.....plenty of time to corrupt her!! LOL!! YUM!!! 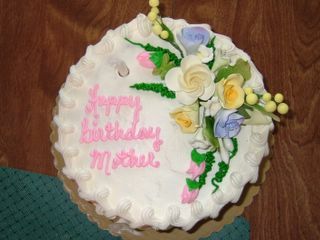 Birthday Cake!!! NO Calories!!!! Made a quick trip home to surprise my Mother as today is her birthday.....and don't you think it is cool how the nation flys the flag in honor of her birthday???? Yep....she's just that special!!! 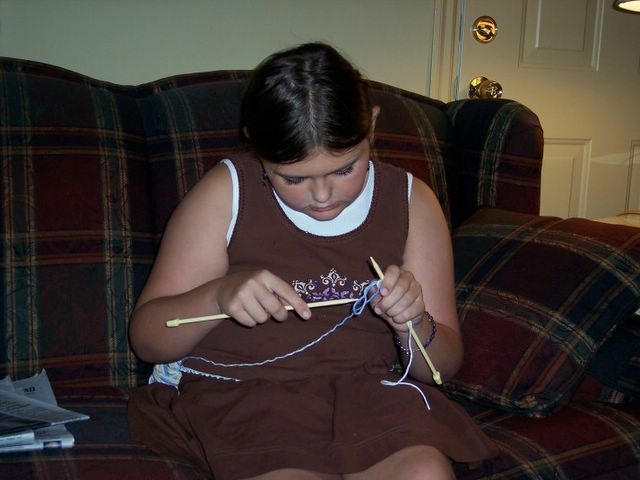 Love of my heart (Great Niece) Montana is showing me how she has learned to cast on!! She is REALLY good at this!!! Montana is just learning to knit and is only 10 years old!!! Oh how I wish I had learned when I was her age......might actually be good by now!! LOL!! Montana is working on her first "warshrag". I am SOOOOOOOO proud of her!!!! 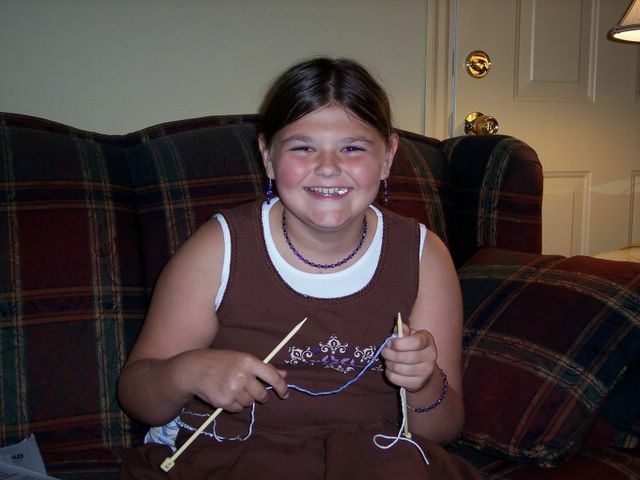 Her knitting stitches are very good!!!! She is going to join me tomorrow night at my knitting group...Chicks with Sticks.....and she is very excited!! 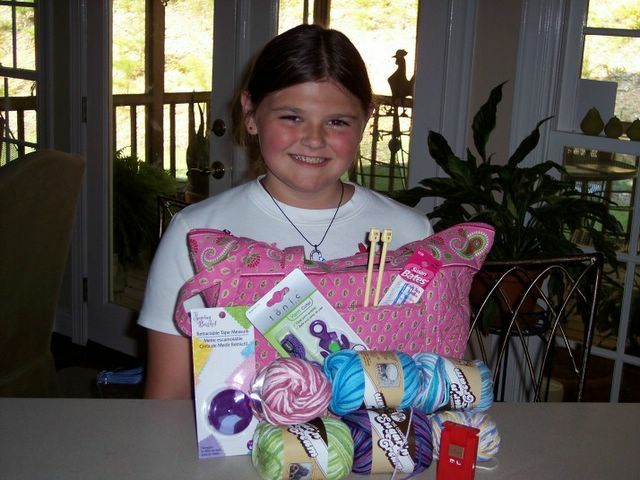 We are going to go shopping tomorrow for some of her "very own" knitting supplies!!! As she only has the ball of yarn she is currently working on I feel it is my DUTY as her Great Aunt and yarn collector to get her started down this road and will do my best to fill her knitting bag tomorrow!!! Nothing new to post regarding knitting....been quite busy lately!! After 14 years I broke down and bought a new car this week! It is AMAZING at the features on cars these days! When I bought my last car CUP HOLDERS were not even invented! LOL!! I keep trying to find excuses to drive it is so much fun!! But alas....the bliss will end next month when first payment is due! LOL!! Been 8 years since I've paid on a car.....OUCH....that's going to bite into my yarn budget!! Boo Hoo!! In light of my recent purchase I have decided to try to knit from my stash for awhile. As it is summer and I don't want to knit anything big I'm going to focus on knitting up all my "warshrag" yarn.....I know I have more....will have to dig through my stash to find it all! cute sock KAL for the hurricane sisters.....of course you won't see my name included because I'm STILL sock challenged!! I plan to knit up all my "warshrags" then get back to the sock knitting. I feel so inadquate!!!! Everyone talks about how they whip out socks, how relaxing and fun it is and I just can't quite seem to "get it". Oh well....just add it to the list of all the other things in life I "just don't get"!! LOL!! I will entitle this "What I DIDN'T do on my Summer Vacation". 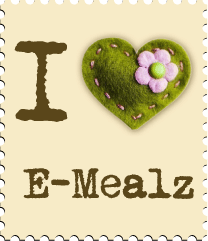 In my blog ramblings yesterday I ran across a this pretty little button and on further investigation discovered the Summer of Stash website. http://soskal.blogspot.com/. After my initial horror at the thought of NOT buying any yarn over the Summer season I realized this is probably a good thing for me as my last count was a little over 200 skeins of yarn on hand!! I seriously need to go on a "yarn diet"...not to mention other diets!! 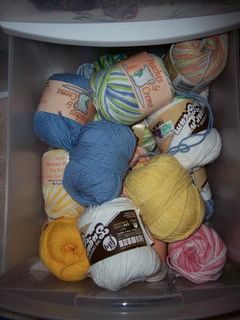 If nothing else it will force me to knit up some of my stash making room for.......you guessed it.....MORE YARN!! LOL!!! O.K. so I haven't been a TOTAL deadbeat lately despite the fact I haven't blogged in a couple of weeks!! Now that summer is here (which here in the south mean HEAT and HUMIDITY)....I'm struggling to knit! I do like making the dishcloths.....anyone that has a pattern and wouldn't mind sharing please feel free to contact me! 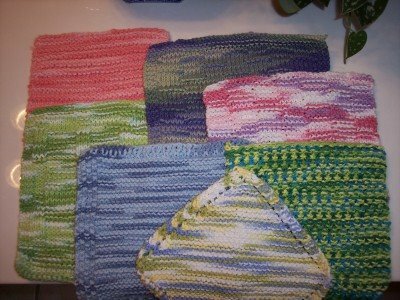 Still haven't completed the ballband warshrag from Mason Dixon....may try to make one this weekend! I'm overwhelmed with other projects that need to be done but just can't get the energy to do them.....like major yard work...exterior house maintenance...clean out the basement, the list goes on and on....oh and in the midst of everything else we are moving the contents of our business warehouse to another location.....all in the HEAT and HUMIDITY!!! Oh well.....we G.R.I.T.S. (Girls Raised In The South)......have GREAT complexions.....no lines on these fabulous faces!!!! Humidity DOES have it's benefits! LOL!! Still haven't attempted my second sock.....will try to get motivated to do this at some point in the near future. I have a few other projects I need to get finished.....like my vest and all the pretty sock yarn I bought before I figured out I was "sock challenged"!